Away from it all. Close to everything. Terrazza at Genoa Ranch is a gated community in the beautiful and historic town of Genoa, in tax friendly Nevada, known for its quaint location and spectacular views. On the Genoa Lakes Ranch Golf Course, just down from beautiful Lake Tahoe, Terrazza is close to the things you want, when you want, and still far enough away from the hustle. 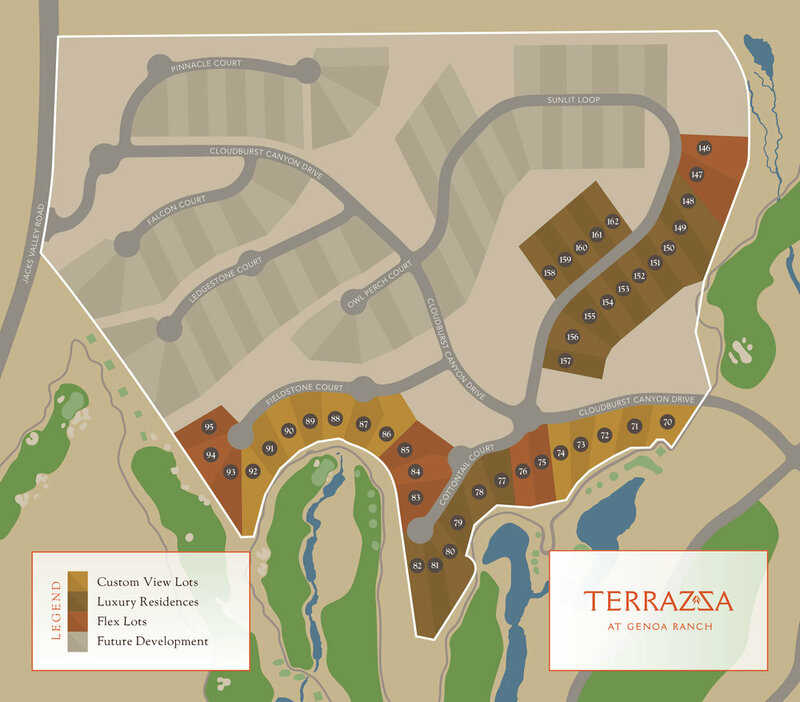 Terrazza consists of 106 beautiful homesites ranging from 1/2 acre to 3/4 acres. The first 43 properties are now available for reservation. These beautiful view lots are the perfect place to build your custom home. Choose from 4 Models ranging from 2600 - 3450 square feet on our beautiful view lots. Flex lots are set aside to build your custom home or choose from one of our 4 models. Thank you for your interest in Terrazza. We are currently accepting contracts for estate lots and taking reservations for new homes. For more information, please call 775.901.6633 or email mdunn@chaseinternational.com.